Rector of Syiah Kuala University Prof. Dr. Ir. Samsul Rizal, M.Eng appealed to Unsyiah graduates to think about how to create jobs, one of them is by cultivating creative business. This was conveyed by rector in the November 2018 - January 2019 period Unsyiah graduation ceremony at AAC Dayan Dawood Building. (Wednesday, 2/6). This time Unsyiah graduate 1,028 students. Where 23 of them graduated with honors or cumlaude. Overall, the number of Unsyiah alumni after the graduation ceremony for this period will reach 124,369 people. 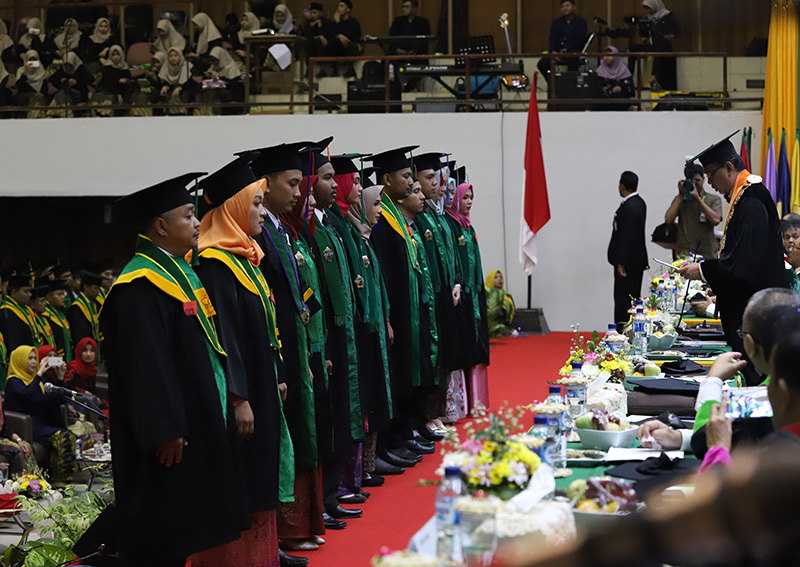 According to the rector, along with the start of the industrial revolution era, college graduates are required not only to be able to understand their scientific fields, but also to be able to collaborate, and adapt their knowledge in various other fields so as to produce unusual work. "This is what this era needs, innovation and creativity that exceed the limits of the average person's ability. If in the past, what was sought was the right man on the right place, so in this era the right man with the right plus is needed, "said Prof. Samsul. So according to rector, students are happy to have been active in various student activities during the study, because they will have many advantages to adapt to the demands of their times. The results of the study indicate that student activities will greatly help students to form their soft skills and lifeskill. These two types of competencies are believed to be very dominant affecting a person's success in the future. Because rector considered, most of the college graduates who were unemployed were those who were softskill and the lifeskill was underpowered. They were not able to see a big opportunity even though it was in sight. That is why, unemployment in Aceh, or in Indonesia as a whole is difficult to suppress. Aceh Central Statistics Agency (BPS) reported that the number of open unemployment in Aceh until 2018 reached 154 thousand people, an increase of 4 thousand compared to the previous year. Unsyiah has worked through various ways to develop entrepreneurial spirit in each student. Among them is by establishing the UPT Entrepreneurship and Business Incubator. One of the creative and innovative business products which is the guidance of Unsyiah Business Incubator, which is the product of Mak Rah Pireng, who earlier this year won second place in the World Innovative Product Competition, in London, England. For this reason, rector emphasized that the opportunity to pursue business for college graduates is very open. The way of thinking and the various competencies they obtain during study will make them become creative and innovative business people, different from ordinary business people. 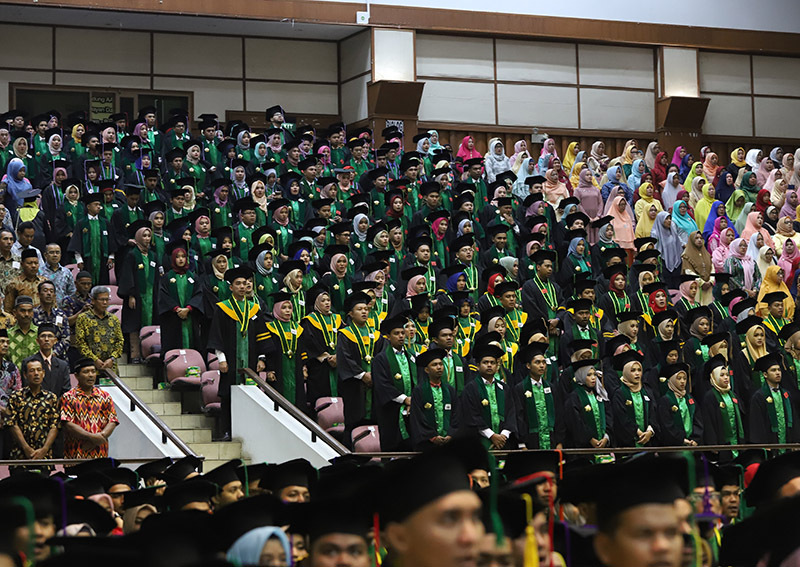 So rector hopes that Unsyiah graduates will be able to open their eyes and minds with what capital they have gained during education, to create and innovate, so that they will not only increase the number of unemployed. "One of the great opportunities now is to engage in creative business, which collaborates with science, local potential, with opportunities and market needs," said rector.